For Blu-ray disc owns who have just got Xiaomi’s new 4K Android TV set-top box – Mi Box, you will come the ideal to stream Blu-ray movies to your large screen TV via Mini Box. The following article will show you how to achieve that. How to stream local video to Xiaomi Mi Box 4K? Before going any further, we should first be clear how to stream local video to Xiaomi Min box 4K. The good news is that the Xiaomi Mi box offers an external USB drive that enables you to play media such as music or video stored on it the the built-in multimedia player offered by Xiaomi Min box. In addition, for those people who wish to better organize all your local media in one place on Mi box and then beautifully display them on your large screen TV, you can also download and install the Kodi player on Mi box for perfect media entertainment experience. No matter which ways you choose to view Blu-ray movies on Xiaomi Mi box 4K, you will first need to copy Blu-ray into digital file formats. Since commercial Blu-ray movies all have complicated copy protection and region code, therefore, you will need a powerful program to bypass that encryption. After a lot of online comparison and testing, we finally settled on Pavtube ByteCopy, which has built-in decrypter to powerfully and automatically break all Blu-ray copy protection including AACS, BD+, Cinavia, UOP, DRM, BD-ROM Mark and High-bandwidth Digital Content Protection, etc. You can then copy the movies on Blu-ray disc without any limitation. If you plan to directly play the Blu-ray movies on Xiaomi Box from USB drive, you will need to use Pavtube ByteCopy to backup Blu-ray to Mi Box supported 1080p MVC video with H.264 compression codec or AAC audio codec. To get Xiaomi Mi Box 4K or Kodi supported audio file formats, you can adjust to output them in the program’s “Profile Settings” window under “Audio section”. 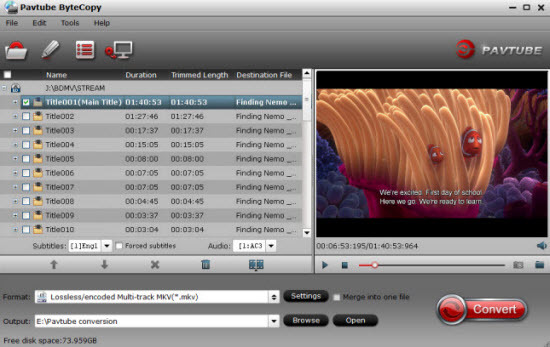 To get better output video and audio quality, you can also adjust other profile settings according to your own needs. For your convenience, the program is available on both Windows and Mac platform (get Mac version). For Windows users, if you choose to encode Blu-ray to H.264 codec, you can take good advantage of the program’s built-in Nvidia CUDA or AMD APP technology to accelerate H.264 encoding with up to 6x faster speed. 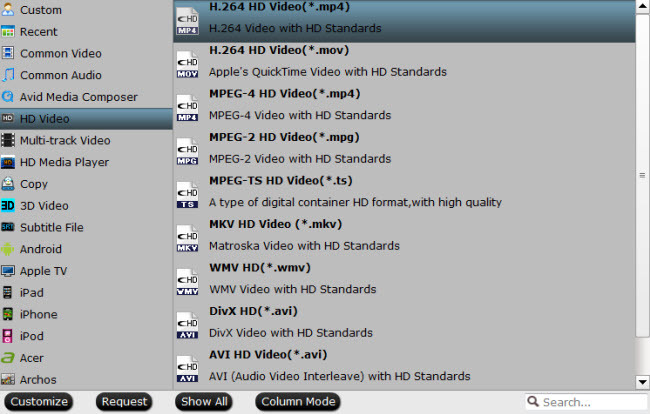 Clicking the Format bar, from its drop-down list, to play Blu-ray movies on Mi box from USB drive, it would be ideal to output “H.264 HD Video(*.mp4)” under “HD Video” main category. To play Blu-ray movies on Mi box from USB drive, you can choose to output any of Kodi supported file formats listed above. Tips: Click “Settings” on the main interface to open “Profile Settings” window, here, you can adjust to output Mi box USB drive or Kodi player supported audio codec, you can also do other settings according to your own needs. Step 3: Start the disc ripping process. After all setting is completed, hit the “Convert” button at the right bottom of the main interface to begin the conversion process from Blu-ray to Xiaomi Mi box 4K or Kodi supported format. When the conversion is finished, click “Open Output Folder” icon on the main interface to open the folder with generated files. You can then have no limitation to watch converted movies on Xiaomi Mi box 4K from USB or via Kodi media player on your large screen TV.